The BHS Roller Transfer Cart (RTC) is a simple but heavy-duty battery changing cart that allows staff to quickly change out a forklift battery. This rugged cart offers excellent safety features and was built to withstand the harsh conditions of battery rooms and warehouses. The RTC has poly-sleeved rollers that can easily handle batteries up to 3,000 pounds. These durable rollers reduce corrosive buildup that can result from electrolyte residue on batteries. The rollers are also spark-proof, which provides an added measure of safety. 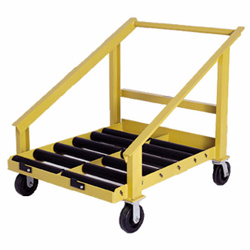 Roller Transfer Carts come in a wide variety of roller heights and compartment widths so you can tailor them precisely to your lift truck fleet. We can even customize designs to your specifications if you can’t find the size you’re looking for. All carts meet OSHA standards and come standard with floor locks to prevent unwanted movement. Our engineers built the Roller Transfer Cart to offer the best in safety, efficiency, and durability. Increase your productivity with a heavy-duty Roller Transfer Cart from BHS. Contact our sales team at 1.800.BHS.9500 to find out more about Battery Carts and Carriages or to find a local dealer.